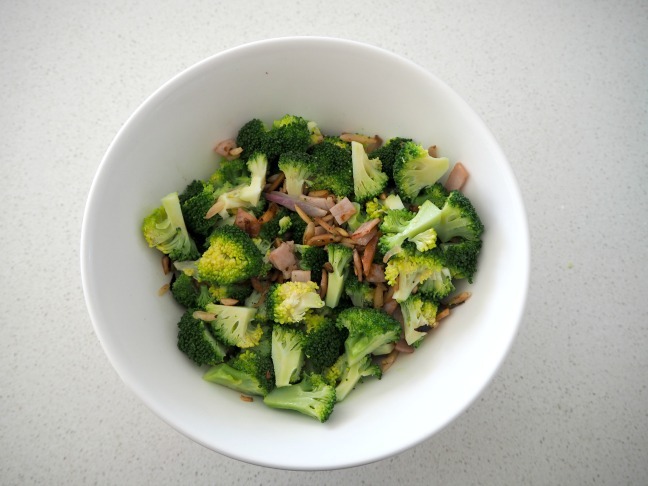 If you are looking for the perfect salad to take along to your next BBQ, this Broccoli and Bacon Salad is for you! 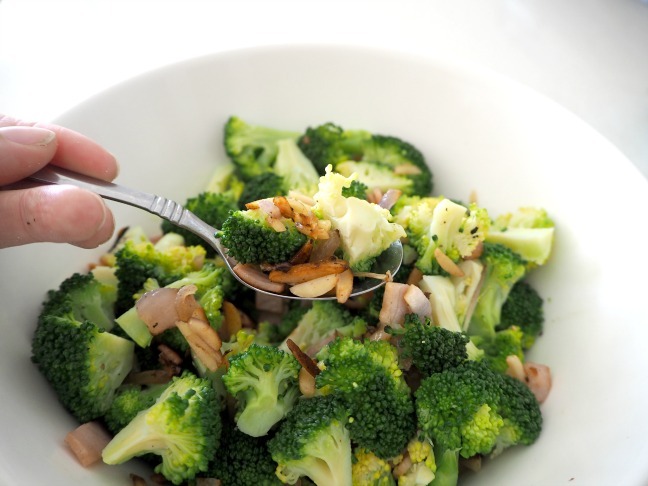 While the idea of eating cold broccoli may not sound very appealing, when it’s combined with crispy bacon, red onions and toasted almonds it quickly becomes irresistible. The secret is to cook the broccoli for just 2 – 3 minutes. When it just begins to soften, quickly rinse it under cold running water to stop it from cooking for longer and becoming too soft and soggy. The other secret to making this super simple salad, is to make sure you use all of the juices from the pan you cooked the bacon, onion and almonds in. This gives the salad lots of extra flavour and helps become the salad dressing – with the addition of a little extra olive oil of course! Another great thing about this recipe is that you can make this salad a day in advance or enjoy the leftovers (if there are any!) the next day. Step 1: Cut the broccoli florets into small pieces. You can also finely cut the stalks ad stem of the broccoli too so that you are just left with the hard woody end. Set aside until needed. Step 2: Bring a large saucepan of salted water to the boil and add the broccoli pieces. 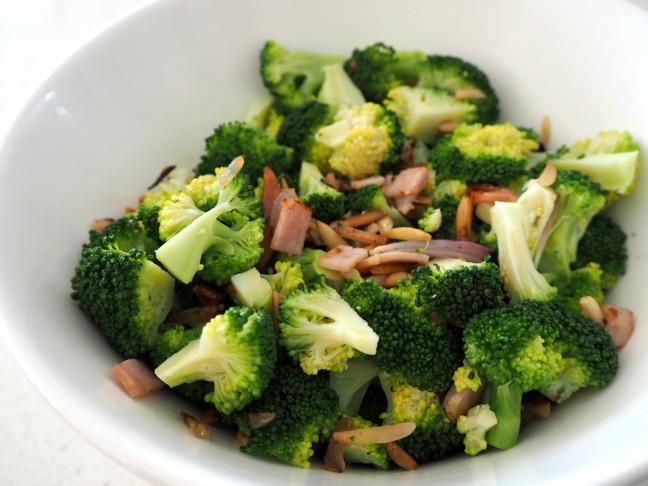 Cook for 2 – 3 minutes until the broccoli has just started to soften. Drain the broccoli in a colander under running cold water to stop the cooking process. 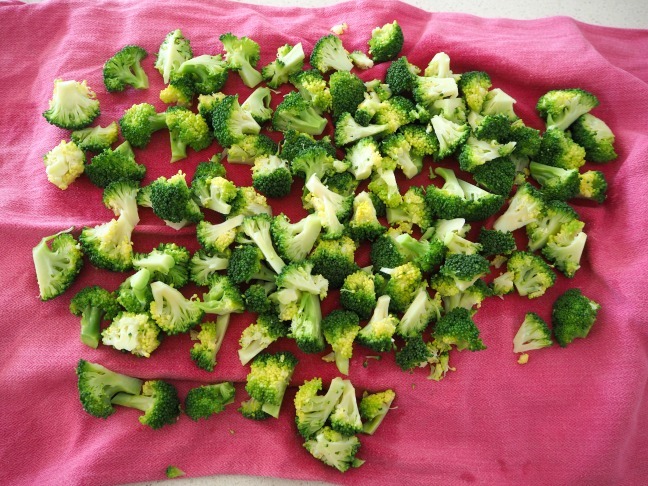 Pour the broccoli onto a tea towel to dry. Step 3: In the meantime, add two tablespoons of extra virgin olive oil to a large frying pan over a medium heat. 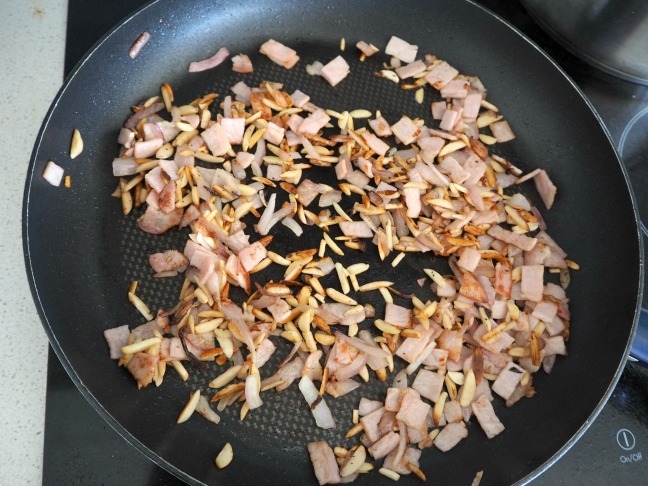 Add the red onion and short-cut bacon which has been finely sliced along with the slivered almonds. Cook for 4 – 5 minutes until the bacon begins to brown and go crispy. Leave in the frying pan for 5 minutes to cool slightly. Step 4: Transfer the drained broccoli to a large salad bowl. Add the contents of the frying pan (including all of the cooking juices) to the bowl with the broccoli. Add an extra ¼ cup of olive oil (you can use less if you prefer) and use a large spoon to combine. Serve immediately.